Intelligent Enterprises which leverage Product Configuration are building out offerings and services differentiating themselves with unique selling propositions to their customers and partners. SAP’s Digital Platform facilitates the integration and extension of processes in SAP’s integrated applications. 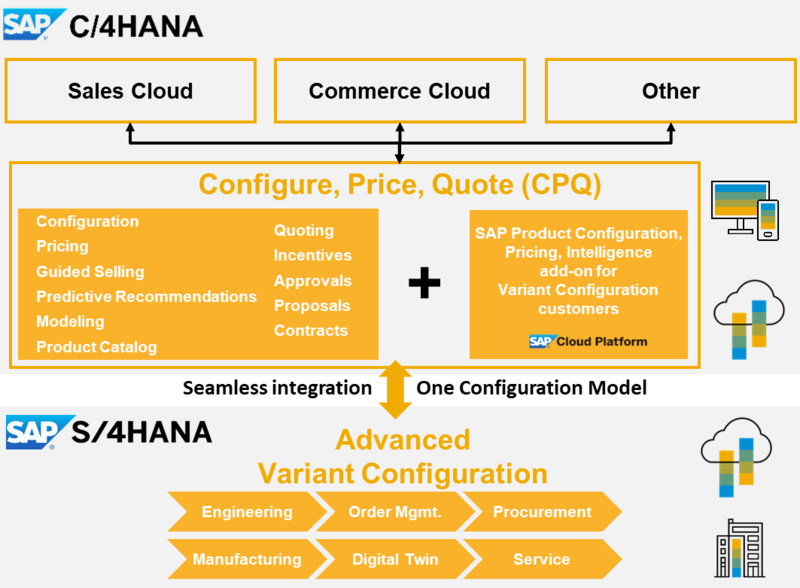 To best leverage their product configuration models along the Digital Configuration Lifecycle, Intelligent Enterprises use SAP Product Configuration on SAP Cloud Platform, a cloud-based and scalable microservice making available their Variant Configuration models and pricing conditions to any custom-specific and market-differentiating offering. With the Intelligent Suite, SAP enables automation of day-to-day business processes and better interaction with customers, suppliers, and employees through applications that have intelligence embedded. What product configuration options are commanding most revenues? How do these revenues vary over time? Over geographies, countries or even in certain regions? What trends can be identified and leveraged to forecast the popularity of options? Which custom-specific options are becoming popular and should be included in the standard offering of a configurable product? Which configuration options or combinations of options create the most challenges in product quality, the supply chain, or in manufacturing and production? Which configuration options or combinations of options create the highest number of customer service incidents and highest maintenance? How can the overall price of a complex configurable product be predicted with more than 90% accuracy based on just a few simple questions? Identifying the right answers to these questions leads to a much deeper understanding of the customers. Customers’ needs can now be predicted and proactively met. SAP is uniquely positioned to deliver the Digital Configuration Lifecycle in the Intelligent Enterprise. The Intelligent Enterprise is more than just automated business processes. It’s a vision about how SAP sees the future of business for our customers, the future of work for our customers’ employees, and the future of experience for our customers’ customers. The Digital Configuration Lifecycle is more than Variant Configuration and Configure, Price, Quote (CPQ). It is an integrated, end-to-end view of Product Configuration over all relevant Lines of Businesses, combined with Intelligent Technologies and Intelligent Automation. Only SAP can deliver the Digital Configuration Lifecycle in the Intelligent Enterprise. SAP has an end-to-end integration across processes that matter most to our customers. Our solutions are and will be built on common master data, domain models, and one platform. SAP has the industry expertise to help make sense of customers’ data in the specific context of their businesses, using insights about their own performance to optimize algorithms. SAP has started to embed intelligence directly into core solutions as part of our customers’ standard road maps, so they do not need to create a separate data lake or purchase additional tools. With Variant Configuration, SAP owns the market-leading solution for Configurable Products in ERP, the Digital Core of any Intelligent Enterprise, and has been the largest player in this market for more than 25 years. With S/4HANA for advanced variant configuration, SAP is massively extending its capabilities within the Digital Core. With C/4HANA Sales Configure, Price Quote (CPQ), SAP owns the market-leading CPQ solutions for the Line of Business sales. With SAP Cloud Platform-based Product Configuration, SAP provides a microservice-based integration approach facilitating the integration and extension of processes around Product Configuration. With Product Configuration Intelligence, a machine learning-based analytics toolset focusing on product configuration-related aspects is provided. SAP’s top priority is enabling the vision of the Digital Configuration Lifecycle in the Intelligent Enterprise for all our customers and to turn it into an omnipresent reality. We will continue to build on existing products, solutions and end-to-end scenarios, deploying them within a unified Digital Platform, enhanced by embedded intelligent technologies. Our primary goal is to make every business of our customers an Intelligent Enterprise.